2017 Audi A4 Pros and Cons: Why (Not) This Car? Given up for dead in the North American market in the late 1980s, Audi bounced back in the late 1990s and in recent years has been the fastest growing premium car company. Through November 2016 they've set 71 consecutive monthly sales records. Audi has achieved this surge despite adhering to its own way of doing things. Unlike the sedans from many competitors, Audis are not patterned after BMWs. Most notably, their engines continue to be located ahead of their front axles, yielding nose-heavy weight distributions and proportions. Why, then, if BMWs represent the ideal, have so many people been buying Audis? The new 2017 Audi A4 provides some clues. Why the 2017 Audi A4? While Audis don't have the most athletic proportions owing to their powertrain layout, their designs have won them many sales. During the 2000s when BMWs and Mercedes pushed the boundaries of taste, ultra-clean Audis served as the epitome of taste. The exterior lines and forms of the new A4 are the crispest and most elegant to date. They've even managed to finesse the proportions such that the latest A4 no longer appears nose-heavy. The new A4's interior also exemplefies the tastefully clean styling for which the brand is known. But I must wonder if they've continued to progress, or have become stuck in a rut. Also, one aspect of the interior defies logic--more on this when discussing the car's instruments and controls. I'm personally a fan of the styling of the current Lexus IS, but it's certainly more of an acquired taste than the Audi's, with a menacing "spindle grille" face (it does work better here than on other Lexus models) and a "1980s hi-tech" vibe to the interior. I first experienced Audi's innovative "virtual cockpit" in the new TT and Q7, and like it just as much in the new A4. Many infotainment operations can now be performed using the instrument cluster LCD and buttons on the steering wheel. The display has two modes, one with a normal-sized speedometer and tach and a second with these reduced in size to allocate the great majority of the available real estate to infotainment. When navigation is selected, a Google Earth-based image of your location fills the display. Quite the show, and it works well to boot. This approach renders the display atop the center stack unnecessary unless a front seat passenger wants to fiddle with the nav or audio. When, then, can this second display not be retracted as in previous Audis, where it was much more necessary? A paradox: now that the display is no longer needed, you can't hide it. Lacking a BMW-like up-kick in the rear window, Audis can appear weak in the haunches. Not this one. Reconfigurable LCD renders the center stack display often unneeded, but it's no longer retractable. Audi led the way to turbocharging, fitting most of its cars with turbocharged 2.0-liter four-cylinder engines about a decade before everyone else followed suit, and the make's latest such engine will leave few drivers feeling the need for more cylinders. The new engine, rated for 252 horsepower (up from 220) but feeling stronger, accelerates the new A4 very quickly once its turbo has fully come on line. Magazines have achieved zero-to-60 times in the low 5s, a stat that required a V8 not too long ago. One downside with the new engine: boost doesn't come on as immediately or as seamlessly as in the old engine. This should be expected, since a higher output requires a larger turbo (unless a second turbo or a supercharger is also fitted, and one hasn't been), and larger turbos take more time to spool up. Last year's eight-speed automatic has been supplanted by a seven-speed dual-clutch automated manual transmission ("S-tronic" in Audi parlance, "DSG" in a VW). Though this tranmission sometimes feels a touch unsmooth when creeping (typical of the type), in most driving it responds extremely quickly and with the refinement premium car buyers expect. Lexus was nearly the last to hop on the 2.0T bandwagon, fitting the IS with such an engine only last year, and even now only with rear-wheel drive. Opt for all-wheel-drive (as in the tested Audi) and the Lexus gets an unboosted V6. The Lexus four doesn't feel nearly as strong as the Audi's despite a minor 11-horsepower difference on paper, and it's eight-speed automatic, while very smooth, isn't as responsive. Everyone has been switching to turbo fours in pursuit of fuel economy. Despite being such a quick car, the new A4 manages EPA ratings of 25 mpg city, 33 mpg highway with front-wheel drive and 24/31 with all-wheel drive. If you're willing to trade off some performance for even better numbers, and don't require all-wheel drive, the new 190-horsepower "ultra" achieves 27/37. In my driving the A4's trip computer reported averages as high as 36 mpg in the suburbs and 34 mpg on the highway. Mid-to-high 20s happened without even trying to be economical. Lexus, perhaps because it's new to turbocharging, can't match these figures. The IS 200t scores 22/32, while the IS 300 (with AWD) manages only 19/26, a full five mpg short of the Audi. Before the 2009 model year redesign, the Audi A4's back seat was too tight for adults of more than average size, and marginal even for these. With the 2017 the back seat has grown yet again. Not only this, but the cushion is higher off the floor than in previous A4s or in competitors, such that it's now the most comfortable in the class. This said, the rear doors could open more widely, such that I struggled to get a decent photo of the rear seat. Since its 2014 model year redesign the Lexus IS has had a passably roomy rear seat, but it can't match the Audi's for comfort. Why Not the 2017 Audi A4? I could easily list a few more reasons to buy the new Audi A4 (and will still discuss these): extremely secure handling, a polished ride, top safety scores. Why not to buy one? Well, an A4 isn't cheap--the moderately equipped tested car listed for $47,900--but a similarly configured Lexus IS costs a little more (2WD, AWD) and European competitors can cost considerably more. The key reason some people will buy a Lexus IS rather than an Audi A4 is that Audis, while far more reliable than in the past, and generally good bets for their first four-to-six years, still don't promise to be largely problem free for ten-plus years the way Lexus cars do. Leasing? Then there's little reason not to opt for the Audi. Audi started the big-grille trend. It didn't work for me at first. It does here. Most comfortable rear seat in the class. But not the easiest to get into and out of. The new Audi usually rides smoothly and quietly, with just a little Germanic thumpiness from time to time. In typical daily driving the Lexus IS's doesn't feel as solid, polished, or composed, and the car consequently doesn't seem as upscale. Beyond styling and cutting-edge infotainment tech, Audi owes much of its success to its much-touted "quattro" all-wheel drive system. Audi led the way here even earlier than with turbocharged engines. The new Audi handles with extreme predictability and composure. Beyond this, it's a very pleasant car to drive day-to-day, holding an advantage here over more tightly wound German competitors. It doesn't hurt that Audi's have open, airy interiors. The outward visibility provided aids driver confidence. Yet I haven't listed handling among the A4's key strengths because they aren't as fun to drive aggressively as rear-wheel drive competitors, especially the Cadillac ATS and Jaguar XE, but even the less-sporty-than-I'd-like, less technically excellent Lexus IS. If you're seeking fun rather than security or refinement, the Audi's handling might be too imperturbable. In short, the new A4 doesn't quite feel sporty, at least not to me. There's nothing in-your-face about the Audi A4 (aside from the fancy new LCD instrumentation). The company doesn't appear to have swung for the fences in any particular area. What they have achieved, though, is an exceptionally well-rounded compact(ish) premium sedan that's unusually pleasant to look at and drive. While some competitors can be more fun, for the driving most people do all or nearly all the time, the new A4 contends with the much more expensive Mercedes-Benz C-Class for the title of best-in-class. 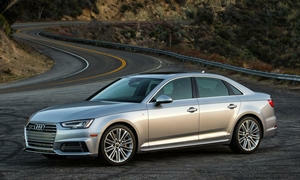 I won't be surprised if Audi continues to set monthly sales records partly thanks to the new sedan. Of course, the more cars Audi sells, the harder it will be to keep breaking their previous record. They'll certainly try, though, so some very attractive lease rates could happen. Rated for 252 horsepower, feels even stronger if sometimes a little laggy. Excellent mpg as well. Now 13 cubic feet, the A4's is about average is size for the class. The rear seat can fold. Audi and Lexus each lent me an insured car for a week with a tank of gas. 2017 Audi A4 pros and cons, according to Michael Karesh: the best reasons for buying (or not buying) the 2017 Audi A4. Join TrueDelta to post your own impressions. This A4 now has ditched the centre differential, making do with a clutch instead. Of course, marketing dubs this downgrade as "Ultra" quattro. Right. It's similar to the Subaru MPT system (for automatics) which in one form or another has been around since 1988. BMW copied the Subie system for their X drive back in 2005, ditching gear centre diffs, but at least changed torque split to 40/60. Still, all three are always "on", not part-time. I still find this new A4 has driver seats mounted too low for my aching knees, and the door too short - hard to get out. The A3/S3/Golf is even worse - there you get your left shoulder jammed against the B-pillar. Hauling yourself out of this black hole across wide sills is unpleasant, and "checking over your shoulder" about impossible. The new Subaru Impreza shows how to design doors, sills, seats to provide ease of entry and egress, and doors long enough that when you look left you still have glass to peer through. It's halfway in size between A3 and A4, has a big back seat, Much better interior than before and seems very well assembled in Indiana. The driver's seat is 100% useless, however, with no side support at the thigh, just mushy foam. Now if it had more power than a battery powered cocktail mixer, I'd consider it. But it doesn't. The search continues. Thanks for posting this--I wasn't previously aware of this change. Reading the press release, it looks like the new system might be only on cars with manual transmissions, at least for now. ..."for the driving most people do all or nearly all the time, the new A4 contends with the much more expensive Mercedes-Benz C-Class for the title of best-in-class." I also much prefer the A4's interior design vs. the competitors'. Cleaner, simpler, more ergonomic. The C-class's interior in particular is full of different shapes and particularly textures, and while flashy, reveals itself to be slightly chintzy when touched (rather than seen). Regarding BMW, can their front-end styling GET any more jumbled and disjointed? I about sprained my eyes squinting at the front of an X3 "M-sport" the other day. You're correct - Audi is on a roll, and this car is likely to help that success continue. Truedelta your the bomb! Ha, a pedestrian engine cover? ?